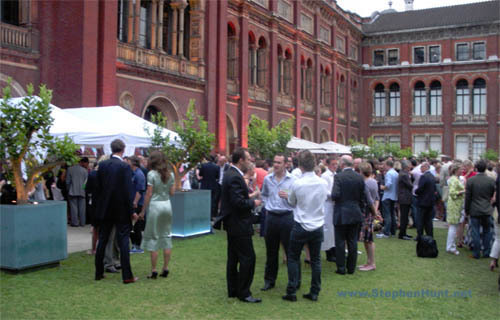 The HarperCollins Summer party this year was held at the Victoria and Albert Museum in London. 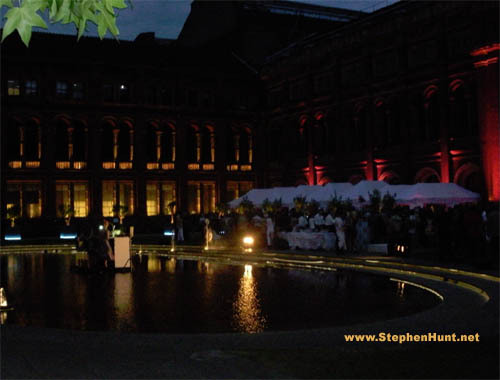 It was a lovely warm evening, with hundreds of authors, HarperCollins editors and staff from all those vital HQ functions – such as the art department (where would those covers and jacket designs be without them? 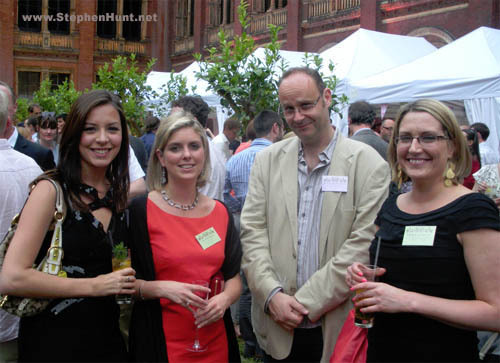 ), sales, PR etc – in attendance. There were also agents by the champagne bucket-load and a gaggle of the publishing house’s celebrity writers – people such as TV historian David Starkey, and politician Peter Mandelson, the third man in the Tony Blair and Gordon Brown love triangle. It was great to catch up with the science fiction and fantasy professionals from HarperCollins Voyager, including Editor-in-command Emma and her right-hand enforcer, Amy (best Yoda voice: Always two there is). 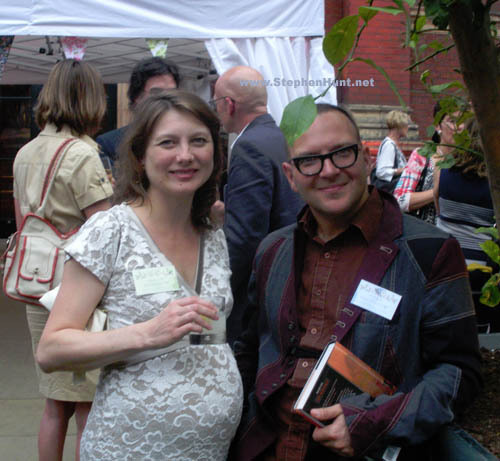 Fellow SFF author (and fellow Canadian) Cory Doctorow was also there, albeit off the booze for the evening, and in good form. Sadly, there were a couple of notable absences due to sickies, including my agent John Jarrold and Booker-winning Wolf Hall author, Hilary Mantel. I actually count Hilary’s win as an aberration for the Booker, that is to say, giving it to a novel that is actually very readable. I’m sure we’ll be back to form next year with the usual obscure, turgid, plotless wonders they find to serve up. Get well soon, John and Hilary! Interestingly, the band for the night was dressed in Victorian dresses, and Cory told us he had previously spotted them playing at a steampunk event he’d recently been invited to. Also in attendance on the genre front were science fiction agent John Berlyne and his partner (also John) from the Zeno agency. He shamelessly led the sci-fi contingent’s raid on the strawberries and cream as I hoovered up the finger-sized chocolate eclairs. HarperCollins grand fromage Victoria Barnsley made the customary speech again this year – the main thrust of her address to the literary nation being matters digital and e-book related, how the likes of Apple were now one of the firm’s customers etc. All in all, a great night. Only twelve months until I’m let out of my box for the next party! The thirsty and the literary! 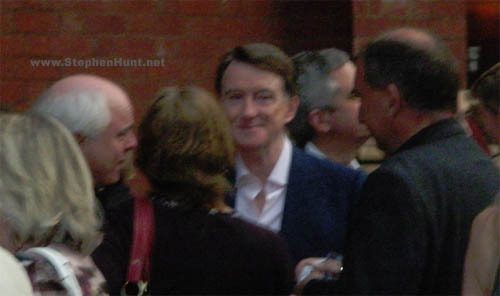 Peter Mandelson gets papped by a mere fantasy author. Oh, the shame of it. Free food and drink? Sure I can party all night! Fantasy authors are born hungry. Great pics! I’ve popped some up on my site too. Sorry I missed you there. Maybe next year?